The quality of your golf game shouldn’t be determined by the climate in which you live, which is why a backyard putting green made from the finest artificial turf makes perfect sense for your game. 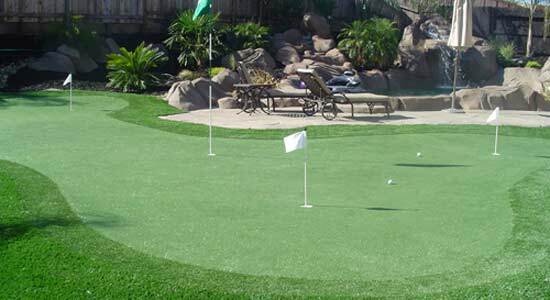 Southwest Greens is proud to offer just such a product; a backyard putting green we’ll custom design to elevate the aesthetics of your backyard or indoor space while elevating your game as well. 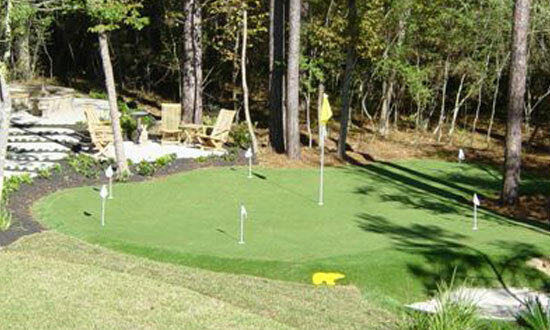 Have you ever thought of having your very own putting green in your backyard? Have you ever thought of the maintenance that goes into a bent grass putting green? Natural putting greens are made with a minimum of 18 inches of sand before they are seeded. You’ll be amazed at how quick and efficiently the installation of a Southwest Greens putting green will be with our professionally trained crew. And once your green is installed its pristine condition will be the rule and not the exception for years to come. Because it’s artificial no watering, fertilizing, or maintenance is required. And because our sand filled greens offer unrivaled support for our bent-grass synthetic turf your game will reap the benefits of a green that plays in exceptionally real fashion. Why is the look, feel, and consistency of our synthetic turf putting greens so reminiscent of the greens on your favorite New Mexico courses? Largely because our greens are made using 7600 Denier Polypropylene Fiber.